Last weekend my wife and I were in Charlotte for some shopping. I was sitting on a bench inside the mall and suddenly I saw a familiar face. It was Abe Jacobs. I said aloud, "Well if it isn't Abe Jacobs." He stopped, looked at me and smiled. I knew he had no idea who I was, but he stepped toward me with his hand extended. I introduced myself and told him I remembered him from Greenville Memorial Auditorium. He said it had been a long time and I said to him, "Abe, you look just like you did 20 plus years ago." He smiled and said, "I still work out, lift weights and I try to stay in shape." I asked if he ever saw any of the guys and he said, no not very much. He said he saw Renee Goulet at a charity golf tournament, and Nikita Koloff. He said he now lives in Shelby. He talked to me for probably 15 minutes about the old days and the guys he worked with. He said that he had both his knees operated on but otherwise was in good health. I jokingly said to him, "Abe, I guess you had to have those knees done because of all those "kiwi rolls" you did all those years." He laughed! He told me about making an appearance at a wrestling convention someplace and a guy was in the autograph line and handed him a big copy of a newspaper ad for a wrestling show he was on. 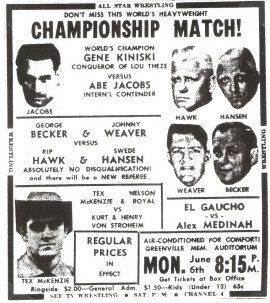 He said it was a big card with Johnny Weaver and George Becker against Rip Hawk and Swede Hanson and a lot of other big matches and the main event was Gene Kiniski defending the NWA title against Abe Jacobs! He said he looked at it and showed it to his wife and said, "Well, I will be the next to go." She asked, "What do you mean?" Abe said, "I will be the next to die." His wife asked, "How do you know that for sure? "nd He replied to her, "Because everyone else on the card is already dead." Abe was really a nice guy and I enjoyed our brief visit. Newspaper Clippings courtesy Mark Eastridge. Additional Research by Carroll Hall.